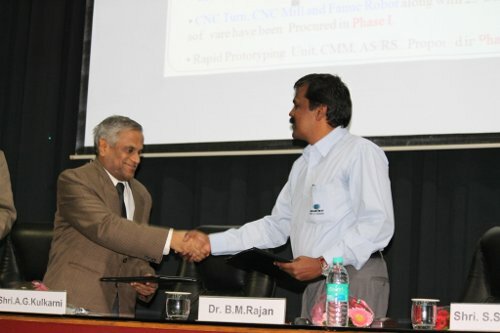 QuEST Global Engineering and KLS’s Gogte Institute of Technology (GIT) signed a Memorandum Of Understanding (MOU) to jointly establish a state-of-the-art training centre and finishing school in design, offering courses in Computer Aided Design/Manufacturing/Engineering (CAD/CAM/CAE). The school will be known as CADAM (Center for Advanced Design and Manufacturing) and set up at Gogte Institute of Technology at Belgaum to cater to the growing number of engineering students from the region. The MOU was exchanged in a function organized at the Gogte Institute Campus between Mr. A. G. Kulkarni, Chairman, Karnataka Law Society, Belgaum and Dr. Matcha Rajan, Senior Vice President, QuEST Global. Also present at the occasion were Mr. M. R. Kulkarni, Chairman, Governing Council, GIT Belgaum, Mr. Sandesh Shirodker, Center manager, QuEST Global, Dr. A. S. Deshpande, Principal and Dr. V. S. Majali, HOD – Mechanical Engineering. This technical course is designed to train students who aspire to join Original equipment manufacturer/Engineering service providers that require design and analysis work. Currently courses will cover FEA(Finite Element Analsys) and CAD while other training courses will be extended depending on the demand over time. Am sure QuEST Global will bring a drastic change in the BELGAUM industrial segment specifically to manufacturing & also create a foot print for the other segments to follow. Once again hearty thanks for QuEST Global for choosing BELGAUM as their business venture.